Advantages of Dental Implants: Overall quality of life, self-esteem and dental health is improved with replacement teeth that look, function and feel like natural teeth. With dental implant teeth, the look of the smile is more natural and the teeth function just like natural teeth. 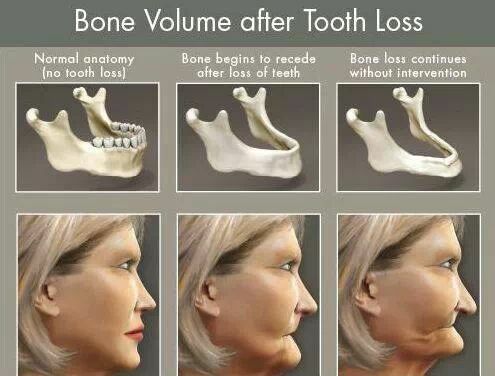 This is because dental implant are the only tooth replacement option that also replaces the root. Therefore, a dental implant comes out of the gum tissue just like a natural tooth. Furthermore, when all the teeth are missing Dr. Nugent can create dental implant dentures. These dentures are anchored by dental implants. Patients don’t have to worry about their dentures falling out. Denture adhesives are a thing of the past. Dental implant dentures free patients from the discomfort of old fashioned dentures. Implant dentures patients can eat, laugh and smile knowing their teeth are locked into place. Implants are the only tooth replacement option that preserves the integrity of facial structures. When teeth are lost the surrounding bone disappears. The teeth and supporting bone help to fill out the face, cheeks and lips. Dental implants are the only tooth replacement option that preserves bone. This is because the dental implant replaces the root of the tooth. Then when chewing, the forces of chewing get transmitted through the implant and into the bone. The bone is stimulated and stays robust. Therefore, by preventing the bone deterioration that normally occurs with the loss of teeth, facial profiles are preserved. This is extremely important when all of the teeth are missing, as the lower one-third of the face collapses. When this happens the chin gets closer to the nose causing a “witches chin” and extensive wrinkles. With Dental Implants your mouth is restored as closely as possible to its natural state. 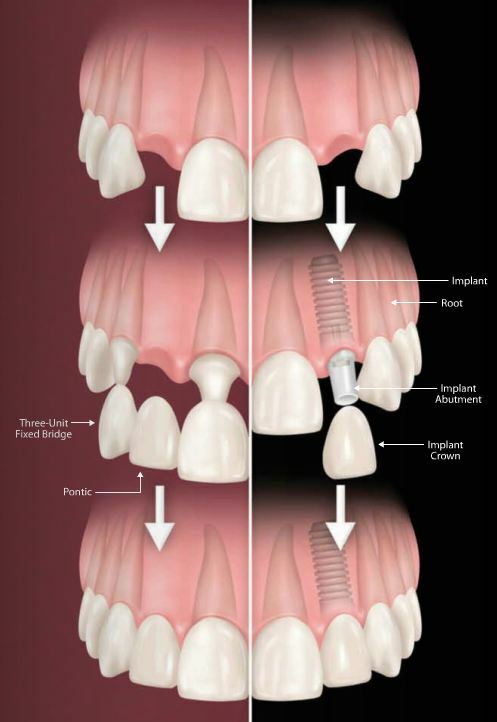 Dental implants replace the ENTIRE missing tooth. Old fashioned treatment options like bridges and partial dentures only replace the top of the tooth. This leads to bone and gum tissue shrinkage causing unattractive black voids underneath the dental work. When the entire tooth structure is replaced it leads to enhanced cosmetics. By replacing the entire tooth it is possible to replicate the function and look of a natural teeth. Your smile is enhanced when replacement teeth look more like natural teeth. Even when only a single tooth is missing, long-term cosmetic are much better with a dental implant restored tooth when compared to a traditional tooth supported bridge. This is particularly significant in the front of the mouth, where preventing a visible bone and gum tissue defect is critical for a natural appearance. Neighboring teeth are not compromised when replace missing teeth. Dental implants do not damage neighboring teeth. 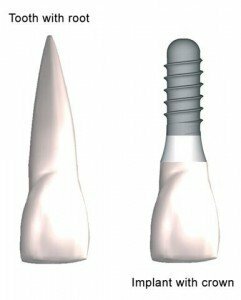 A dental implant is independent of the surrounding teeth. An old fashioned bridge requires the permanent removal of natural tooth structure in order to place the bridge. Now teeth are splinted together in order to “bridge” over the missing tooth. Bridges are difficult to clean and typically have a ten to fifteen year life span. Bridges fail due to decay and the natural teeth needing root canals. In conjunction with, partial dentures have metal clasps that hook onto adjacent teeth. This increased stress and torque put on the adjacent teeth causes the teeth to become loose over time. Plus, plaque accumulates under the clasps causing increased risk for decay. Replacing missing teeth with dental implants does not involve the neighboring natural teeth, so the natural teeth are not compromised, or damaged. To clean a dental implant you simply treat it like a natural tooth. You brush and floss it just like normal. In contrast, an old fashioned bridge requires the use of a floss threader for proper cleaning. This is a cumbersome process and almost all bridge patients do not clean underneath their bridge. 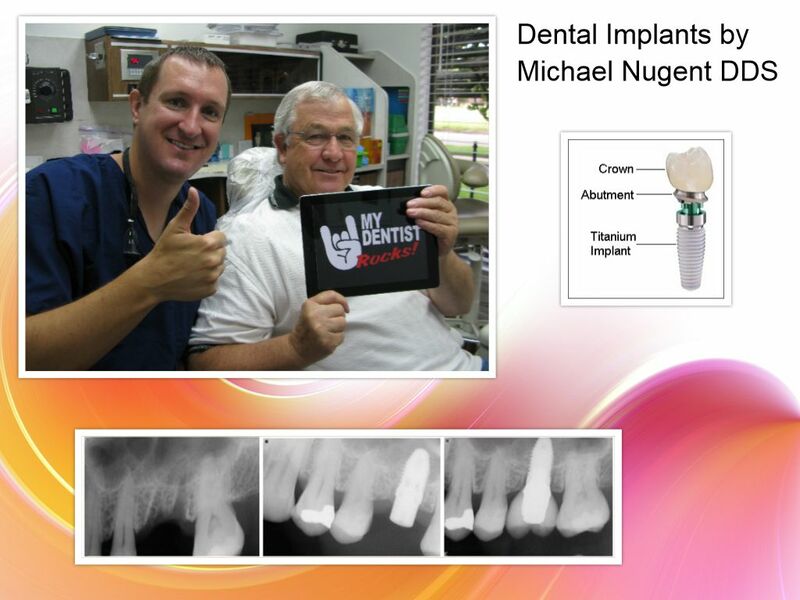 Dr. Michael Nugent is a top implant dentist serving Pasadena and Deer Park Texas. Dr. Nugent is leader in the implant field. He is one of a select few dentist that can both place and restore your dental implants. Get all of your dental treatment from the same doctor. 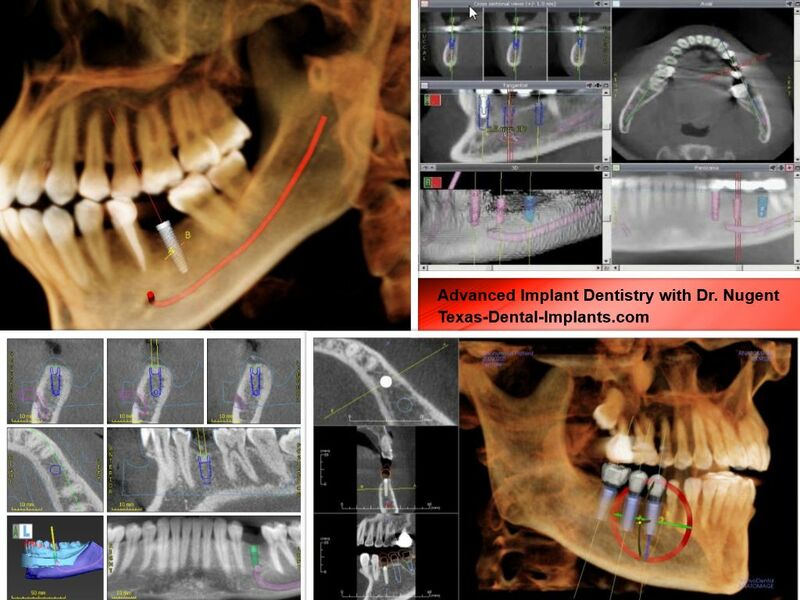 Furthermore, Dr. Nugent has a advanced 3D conebeam X-ray machine that allows Dr. Nugent to offer dental implants easier, more predictable and safer. Experience matters, go with the best implant dentist for you and your family! His office is located at 3421 Burke Rd, Pasadena, Texas 77504.